Description: All-around board for entry to expert riders. 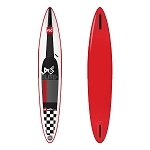 Detailed Info: A highly versatile all-around shape optimized for both flat water and surf. Wide footprint provides great stability, while slightly less volume and subtle rail shaping keep the board light and nimble. All-around rocker line blends outstanding glide with great turning ability. Newly refined graphics ensure that the 11.3 will continue to be a standout for years to come. Built in Epoxy ASA construction for lightweight and durability, the 11.3 comes equipped with full EVA deck pad, deck box with transport handle, and epoxy fin. DuraTectm A semi-custom epoxy construction that is strong and especially ding-resistant. Ideally suited for sport and recreational paddlers who do not want to "baby" their board, but expect it to continue looking good. DuraTectm involves thermo-laminating a very thin layer of ASA composite to the board's bottom and rails. DuraTectm replaces the need for paint or gelcoat so the overall gains are in strength, not weight. Full DeckFeatures a factory-installed, full length EVA deck pad. Ultra-plush, durable EVA is factory-installed so that all you have to do is go paddle. Embossed snakeskin tread sheds water and provides a comfortable platform with great traction. HandleIncludes a convenient molded transport handle. Molded handle tucks into deck and stays out of the way when paddling. Deck BoxIncludes inset deck box for optional sailing rig. When the wind is up, having the option to sail adds incredibly versatility to your standup board! 9" US deck box fits standard mast foot. Solstice Sports Notes on The Amundson 11'3” Paddle Board: The Amundson 11'3” is really an awesome board. It has less volume than the Amundson 11'6” making it more maneuverable, especially in the surf! It is also a great flat water board for those who don't need the stability of a longer higher volume paddle board. Surfers will love this paddle board in the waves though! It's got enough volume to catch waves early but is more maneuverable so you can still carve easily while paddle surfing!